2018 has been a good year for online casino jackpots with some of the biggest progressive jackpot games making some pretty massive payouts. Microgaming’s famous millionaire-maker slot, Mega Moolah, has kept up its lucky streak and awarded not one, but two lucky players, seven-figure jackpots back to back. The biggest of the two recent Mega Moolah jackpots was picked up on Thursday, April 19th. The lucky Canuck triggered a huge jackpot playing Mega Moolah at Grand Mondial Casino. The player has chosen to remain anonymous, so we don’t know what part of Canada they’re from or what the newly-minted millionaire plans to do with their money. All we know is, the jackpot was $5,691,921, and the lucky player picked up this life-changing amount of money for a song. Going from strength to strength, the Mega Moolah game continued its streak of paying out one jackpot per month in 2018. There’s every chance that they’ll match their 2017 record where they paid out a total of 12 jackpots during the year. An interesting fact we do know about the winner is that he scored this life-changing win playing on his mobile device. This is even more proof that mobile casino is taking over the industry with more big winners being made playing on their handheld devices. After this mammoth Canadian win, Mega Moolah paid out another massive jackpot, this time in England. The lucky British player managed to trigger the eponymous bonus wheel and pick up a staggering £1.7 million-pound jackpot. Mega Moolah broke their record of one jackpot per month when they paid out this progressive bonus win the very next day. We have no more information about this jackpot win—who won it, what online casino they were playing at and how the winner will spend their windfall. However, the astonishing back to back win is yet another boon for the famous Mega Moolah slot. Another indication of just how random progressive jackpots can be. 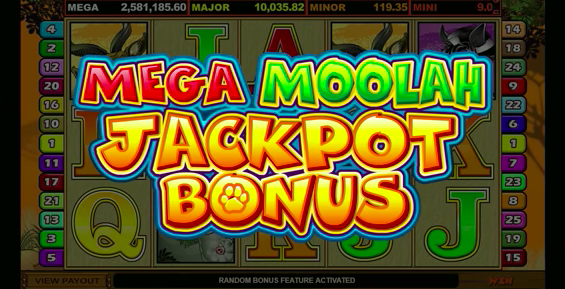 Microgaming’s Mega Moolah is probably the most famous progressive jackpot slot in the world. With good reason too, this slot game has made the most millionaires out of any slot game in the world. Their jackpot pool is accumulated across the network of numerous online casinos hosting the game, which is the reason why the game regularly awards impressive seven and even eight-figure amounts. Interested in finding the best online casinos on the net? No problem – check out or unbiased casino reviews here!